Property 7: HOP INTO APRIL WITH 20% DISCOUNT SUNDAY-THURSDAY BOOKINGS. RATES UPDATED! Property 17: Deal buy 3 nights get the 4th night free!! WiFi! New Luxury Mattress!! Private, beautiful setting waterfront cabin on pristine waters of Craig Creek. Property 23: Private, beautiful setting waterfront cabin on pristine waters of Craig Creek. Property 26: Peace like a river -- and more! 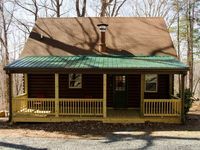 Property 34: Warm & Cozy Cabin w/Deck on Top of the Blue Ridge! Property 35: Snuggle with Your Honey in our Cozy Log Cabin! Property 44: Cozy Scottsville Cottage w/ River Views & Gazebo!